During the past 20 years, with the advent of highly effective antiviral drugs for Hepatitis B virus (HBV), we have witnessed successful viral suppression as well as the delay and prevention of progressive liver disease leading to cirrhosis and hepatocellular carcinoma (HCC).. Nonetheless, as reported previously, we are observing a persistent risk for HCC in patients who have maintained successful suppression of viral replication with undetectable serum HBV DNA and normal liver function, even in patients who have been on anti-HBV therapy for greater than18 years . The duration of anti-HBV treatment for these patients ranged from 9.3 to 18.4 years (highlighted). Patients remained with undetectable serum HBV DNA for 6.7-12.4 years (highlighted) before developing their first HCC. The result of the observation is shown in table 1 . HCC: Hepatocellular Carcinoma, HBV: Hepatitis B Virus, LAM: Lamivudine, TDF: Tenofovir Disoproxil Fumarate. *From Minerva Gastroenterol Dietol 2017; 63: 74-76. . In addition, among patients who are on antiviral therapy and post first tumor ablation, some of them continue developing new HC or recurrent HCC several years (5-10 years) after the first HCC (personal communication). In most cases, however, continued antiviral therapy and additional tumor ablation has been successful and patients remain well on continued antiviral treatment. While we are grateful for the current management of HBV associated HCC, there is a desperate need for the drugs that can eradicate the virus. Recent update of the development of potential HBV cure drugs was recently presented by Levrero et al. and Block et al. . The lucidly illustrated “the landscape of HBV cure efforts” by Levrero et al. is shown below . The chart clearly reveals the potential treatment strategies in the future (Figure 1). Figure 1. The landscape of HBV cure efforts. 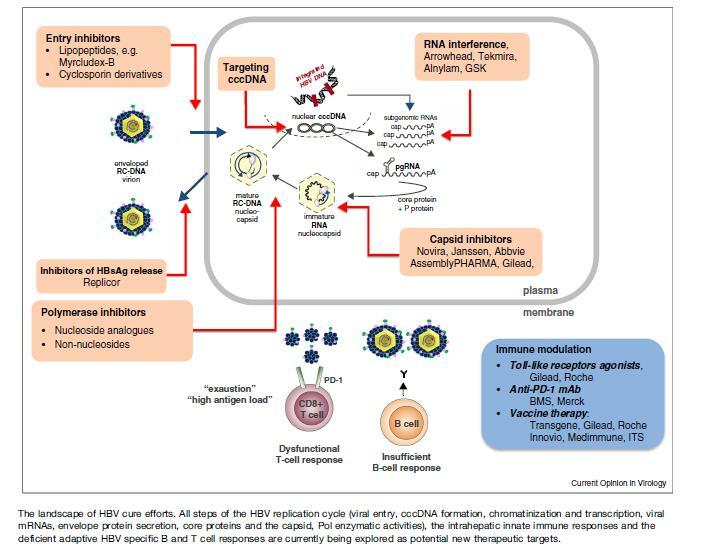 All steps of the HBV replication cycle (virus entry, cccDNA formation, chromatinization and transcription, viral mRNAs, envelope protein secretion, core protein and the capsid, pol enzymatic activities), the intrahepatic innate immune responses and the deficient adaptive HBV specific B and T cell responses are currently being explored as potential new therapeutic targets (Lavrero et al. ). © 2018 Yoo J. This is an open-access article distributed under the terms of the Creative Commons Attribution License, which permits unrestricted use, distribution, and reproduction in any medium, provided the original author and source are credited.